MINNEAPOLIS — Any more questions, America? After falling to the depths of college basketball during the madness of last March, becoming the first No. 1 seed in history to lose to a No. 16 seed, and suffering the scorn of the American sporting public, Virginia rose from purgatory to paradise Monday night. The Cavaliers, who have been criticized for “ruining the game” with methodical, slow-tempoed play, and have been ripped by pundits for an inability to win in March, unable to score enough to win big games, and also for choking in the biggest moments, silenced detractors with a performance for the ages, with an 85-77 overtime victory over Texas Tech to capture the program’s first national championship. In the biggest turnaround by a team, not just in college basketball, but in all sports in recent memory, Virginia was a team of destiny. The Cavaliers pulled out odds-defying wins against Purdue and Auburn to reach the NCAA title match and required another come-from-behind effort to take the Red Raiders into overtime. Trailing 68-65 with 22 seconds to play in regulation, UVA’s De’Andre Hunter drilled in a 3-pointer to deadlock the game with 12 seconds showing, and left it up to Virginia’s smothering defense to finish the job. Texas Tech got off an off-target shot to send the game into overtime, where the Cavaliers dominated, outscoring their Big 12 opponents, 17-9. Hunter saved his best for last as he posted a career-high 27 points, taking over the game like the NBA lottery pick that he’s projected to be. Kyle Guy, the Final Four’s “Most Outstanding Player,” turned in another clutch performance with 24 points and played all 45 minutes of the game. Ty Jerome, the other part of UVA’s “big three,” scored 16 points and dished out 8 assists, as the Cavaliers finished the season 35-3. 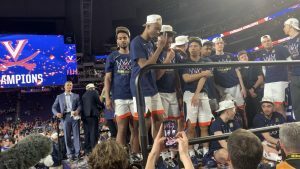 Virginia’s embarrassment and humiliation from last March transcended into jubilation and “One Shining Moment,” the song that traditionally plays after the confetti-covered victors climb the ladder to cut down the championship nets. In all their joy of capturing the NCAA Championship late Monday night, with chants of “U-V-A, U-V-A,” ringing throughout the cavernous U.S. Bank Stadium, there was a brief moment of reflection upon last year’s grief and how it inspired this year’s title drive. “I think everyone on the team, as soon as the buzzer sounded (last year) and we were done with the press conference, we knew we all had the same goal in mind for next year, and that was to win a national championship,” said Guy. Guy took that defeat hard. The avatar on his Twitter account, screensaver on his phone, feature a photograph of him in tears, on his knees with UMBC’s underdogs celebrating in the background. He’s kept it as a daily reminder of his goal and has used it as fire to return to glory. Yes, he said he’s planning to change that photo, likely something with a more happy memory involving a championship net. During all the celebration of the title, there didn’t seem to be a lot of tears shed in the madness this time around, although Jerome confessed he cried. For all the exposure that Jerome and Guy receive, the Cavaliers would have never been cutting down the nets Monday night without a hair-chested stretch of basketball by Hunter. Not just one offense, where his 27 points were vital in answering an aggressive Texas Tech team, but on defense, where he did a masterful job on Red Raiders’ top scorer Jarrett Culver. Culver, Tech’s leading scorer on the season, finished with 15, but five of those came at the free-throw line as he went 5 for 22 shooting and was shut out from the 3-point line, going 0 for 6. Culver didn’t make a single shot in the first half as Hunter, the National Defensive Player of the Year, handcuffed the Red Raider star, smothered him with Hunter’s incredible wingspan. Texas Tech coach Chris Beard tried to switch so that Hunter would have to guard someone else and give Culver more open looks, but it didn’t really work. “Wow, 5 of 22,” Virginia coach Tony Bennett said afterward. “I didn’t realize it was that. [Culver’s] such a talented player. We wanted that matchup. When Texas Tech went small, we had to match and go small, and Braxton (Key) did a great job. Dre’ (Hunter) made (Culver) work to get shots. Hunter struggled again offensively in the first half, just as he did against Auburn on Saturday night. But also like in the semifinal game, Hunter came out on fire in the second half. The Virginia redshirt sophomore forward, who many believe will turn pro now (Hunter was non-committal when asked about it after the game), was only 1 for 8 at halftime, but finished 8 for 16, 4 for 5 from the arc, and 7 for 9 at the free throw line, to go along with nine rebounds in 44 minutes, 19 seconds of court time. Hunter said that he tried to be aggressive in the first half, but his shots weren’t falling. The second half, they fell, and fell, and fell as he kept delivering lethal jabs into the Red Raiders’ mid-section. “You’ve got to give [Hunter] a lot of credit,” Beard said. “They iso’d him, and he hit just a lot of tough shots. Matt Mooney is an All-Big 12 defensive player. We had Matt on him. We put Jarrett Culver’s length on him a little bit. Enough tough shots to boost oft-criticized Virginia from purgatory to paradise in one night of Shining Moments that will live forever.